Hotel Kristály is nowadays the only building in Hungary, which was built to provide accommodation, and since the establishment, in 1770, still has been working as a hotel and accommodating guests. We offer a collection of standard and superior rooms to suit your needs. All of our rooms evoke a feeling of convenience, combined with classic design. All of our 50 rooms feature comfortable queen size, double or twin size beds and shower or bathroom. 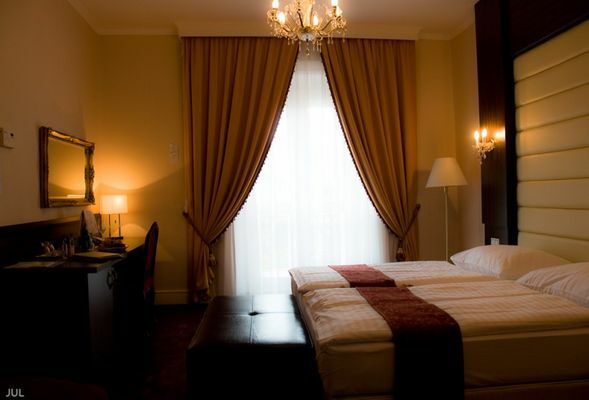 'Esterházy' Wing: It was renovated in 2006 and 10 four stars superior rooms and a superior suite offer comfortable accommodation for the guests. Whirlpool bath, large room size, LCD TV, sofa, subdued lights or balcony make standard equipment up to superior. 'József' Wing: It was renovated in 2007 and 9 three stars standard rooms provide accommodation for the guests. Three of them are single rooms with king size bed and one is for physically challenged guests. A single and a double room is connectable for families. 'Erzsébet' Wing: This is the new part of the Hotel with 27 standard rooms, 2 superior apartments with balcony and a standard double room for physically challenged guests. Hotel facilities: 24 hours reception, standard and superior business rooms, rooms for physically challenged, rooms for family, non-smoking rooms, free WIFI in the public areas, meeting room, room service, underground garage (free of charge), airport shuttle, massage therapy, program arrangement, baby cot, babysitting, laundry (external), bike rental, pet allowed, left luggage, 'Esterházy' Restaurant, credit card acceptor (Visa, Master Card, Maestro, Amex, JCB). • Half board is available at 3700 HUF per person. • Pets are allowed for an extra charge of 6000 HUF per day. Rates are including breakfast buffet, (Bed and Breakfast Package), full use of the wellness facilities (Crystal SPA), rental of a robe, usage of towels and taxes. We offer a collection of standard and superior rooms to suit your needs. All of our rooms evoke a feeling of convenience, combined with classic design.Whirlpool bath, large room size, LCD TV, sofa, subdued lights or balcony make standard equipment up to superior.